The original idea was to use quinoa instead of rice in a mackerel kedgeree. However, for some reason, my water judgement went a tad haywire and so I ended up with a quinoa kedgeree which was a bit wet. Still, the end result was really delicious and I will be repeating the recipe (with more success the next time I hope!). The mackerel used here was fresh. But for kedgeree, tinned fish would work quite well. My following version of quinoa mackerel kedgeree is adapted from Jack and Jamie. First, prep the mackerel. Place it in a pan and add water just enough to cover the fish. Add a pinch of salt, bay leaf and peppercorn. Bring to boil, lower heat, cover and simmer for about 8 to 10 minutes till the fish is cooked. Remove the fish to a plate and let it cool down. Reserve the poaching liquor (you can remove the bay leaf and peppercorn if you like). Once the fish is cool enough to handle, separate the flesh from the bones. Leave the flesh in large chunks and set aside. Peel, wash and dice the onion,. Wash and grate the ginger. In a bowl, combine the powdered spices – turmeric, cumin, coriander and garam masala. Heat the ghee in a frying pan. Once it is hot, lower the heat and add the mustard seeds and green cardamom. Stir for 30 seconds and throw in the chopped onion and salt to taste. Cover and cook for 5 minutes. Uncover and add the garlic, ginger and green chilli. Cover and cook for 5 more minutes. Uncover and add the chopped tomato. Cover and cook for 2 to 3 minutes. Uncover and add the quinoa, peas and powdered spices. Mix well. Now measure the poaching liquor and add it to the pan along with additional water, if required. Usually, the ratio of quinoa to water is 1:2 or 1:3. Stir everything together, bring to boil, cover and cook for 20 minutes. While the quinoa is cooking, hard boil the egg. At the end of 20 minutes, uncover the quinoa pan and add the spinach, lemon juice and mackerel flesh. Combine very gently making sure that you don’t break up the fish. Cover and cook for 5 minutes till the spinach is wilted. Shell and quarter the egg. Plate the quinoa kedgeree. Garnish with parsley and egg quarters. Enjoy hot. The other day, I was chatting to my friend Meher who told me that she had had one of the yummiest colocasia preparations for lunch, courtesy one of her work colleagues. She didn’t know the recipe except that the tuber was first fried in order to get rid of the stickiness. This got me thinking about how I have not had colocasia in absolutely ages, probably years. Since it is a starchy root vegetable, the kooky side in me decided to look up its nutritional information in order to decide whether to cook with it or not. Was pleasantly surprised to discover that although high in calorie (100 grams has 112 calories, more than potato), the root is very low in fat and protein and “is one of the finest source of dietary fibers“. It also contains minerals, potassium and vitamins from the B-complex group. Since the calorie count is high, I decided to team it with a couple of other vegetables to make a balanced meal. I don’t mind the fact that it is sticky so I boiled the root before adding it to the curry. An alternative would be to saute the boiled slices to get a crust before slipping them in the sauce. I made up the recipe as I went along and, if I am allowed to boast a little, this is one of my kooky triumphs. You know how sometimes you cook something and its like, “meh”. And other times you make something which turns out so stupendous that you want to share it with everyone and shout from the roof-top… Okay, you get the picture! Oh, and it smells totally divine. Will go very well with any type of flat bread like roti, naan or even sliced. Can also be eaten with rice. First, boil the colocasia till it is firm but tender. You can either do this in a pressure cooker or in boiling water. Once the colocasia is cooked, let it cool down. Wash, peel and slice it in thick rounds. Wash and dice the tomato. Wash the green pea and sweetcorn kernels. Whisk the yoghurt and add the turmeric, chilli, coriander and cumin powders to it. Mix well and set aside. Break the dry chillies into 2-3 pieces each. Once hot, lower the heat and add fennel seeds, dry chillies and asafoetida. Stir for about 30 seconds. Add the chopped onion and salt to taste. Mix, cover and let the onion cook for 5 minutes. Uncover and add the paste of ginger and garlic. Stir well and let this cook for 2 to 3 minutes. Next, add the chopped tomato. Cover and cook for 3 to 4 minutes. Uncover and add the spiced yoghurt. Stir everything together and cook for 3 to 4 minutes. Add about 2 cups of water, increase the heat and bring to boil. Once the sauce starts boiling, lower the heat and add the sliced colocasia, green pea and sweetcorn kernel. Take the pan off the burner and let it sit for 5 minutes before serving. There are so many different variations of potato pancake all over the world that it can get a bit confusing differentiating between them. Traditional Swiss rösti recipe doesn’t call for eggs and flour whereas the Jewish latke does. My version includes eggs and instant oats (instead of flour) so does this mean that I have made a latke or a rösti or neither (because of the oats)? See what I mean about the confusion?! Today’s recipe is a union of two separate ones that I came across on the internet. The first was fresh pea, courgette and parmesan rosti by Ainsley Harriott on the BBC food website. While I found it interesting, I wanted to include sweet potato as well. Ainsley’s recipe includes eggs and I wasn’t sure whether a rösti of sweet potato and eggs would work so researched a bit more and came across Sweet Potato Rösti (hash browns) by Julia Mueller of The Roasted Root. Julia’s recipe is a frills-free, elegant one of sweet potato and eggs. So I decided to combine the two with a couple of my kooky modifications. 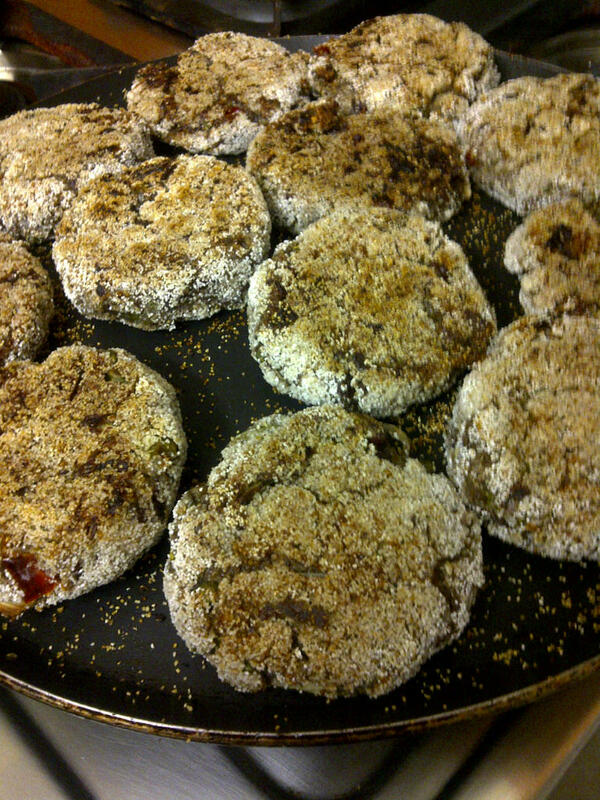 Firstly, I substituted rice flour (from Ainsley’s recipe) with instant oats. And secondly, I didn’t squeeze out excess moisture from grated courgette and sweet potato nor did I blanch the green pea as that would have meant stripping the vegetables of vital nutrients. First work on the pine nuts. Dry roast them in a frying pan till they turn a couple of shades darker and release a lovely nutty aroma. Set aside. Next, work on the vegetables. Roughly crush the green pea in a food processor. Peel, wash and coarsely grate the sweet potato. Wash and grate the courgette. Wash and shred the basil leaves. In a mixing bowl, combine the grated sweet potato, courgette, crushed green pea, chopped onion, shredded basil leaves, toasted pine nuts, parmesan and salt to taste. Keep this mixture aside for a couple of hours. This will allow the oats to absorb excess moisture from the sweet potato and courgette. When you are ready to cook, gently beat the two eggs and fold them into the vegetable mixture. Add the batter, one spoonful at a time, leaving space in between. Don’t worry if it is a bit watery of runny, it will firm up thanks to the eggs. Gently pat down the rösti with the back of the spoon. Cook for about 10 minutes. Flip over and cook the other side for 10 minutes. As summer peaks its head from around the corner, it is time to say au revoir to green garlic, fresh turmeric and purple yam. I made it in under an hour while enjoying The Soul Of Motown. I love Gladys Knight & The Pips’ version of I Heard It Through The Grapevine, what do you think (in at 17:09)? Coming back to today’s recipe, you can use white or sweet potato instead of yam. 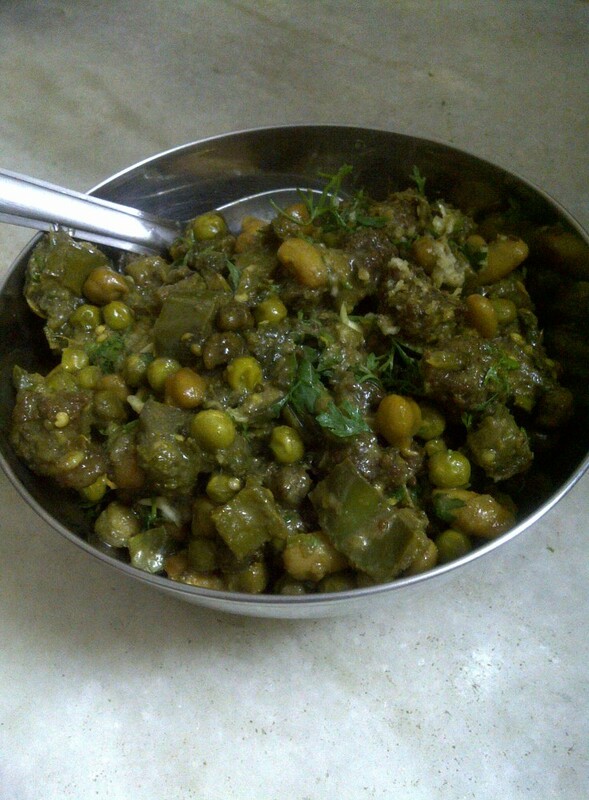 Substitute green peas with any other type of fresh beans or even dried beans. As for the aubergine, I used the small black variety but, again, you can use the type which is fresh and/or in season. Will go well with roti, bread roll or even tortilla. Peel, wash and cube the purple yam into medium sized pieces. Wash and cube the aubergine and leave it in water to prevent it from turning black. Chop and wash the coriander leaves. Peel the garlic and lightly smash the cloves with the knife. Heat oil in a wok-like pan. Once it is hot, lower the heat to minimum and add the carom seeds followed by the asafoetida. Stir for 30 seconds. Add the smashed garlic cloves and beat them with the back of the spoon (they will break easily). Add the purple yam, aubergine, green peas along with half cup of water. Toss in the turmeric, ground coriander, ground cumin, chilli, ginger, coconut, coriander and salt to taste. Mix well, cover and cook for about 20 minutes. After 20 minutes, uncover to check whether the vegetables are cooked. If so, take off the stove. If not, cover and cook for 5 t o10 more minutes. Isn’t it amazing that you can eat a particular food all your life not knowing how it is made? One of the many advantages of food blogging is the number of new things I learn on a regular basis. When I sit down to write a post, I like to look up information about the dish or its key ingredients on the internet. Although most times this research is retrospective – after the meal has been cooked and consumed – it is still useful to know and share with fellow kooky cooks. Rice flakes are also known as flattened rice or beaten rice or pohe. For convenience’s sake, I will refer to them as pohe in this post. 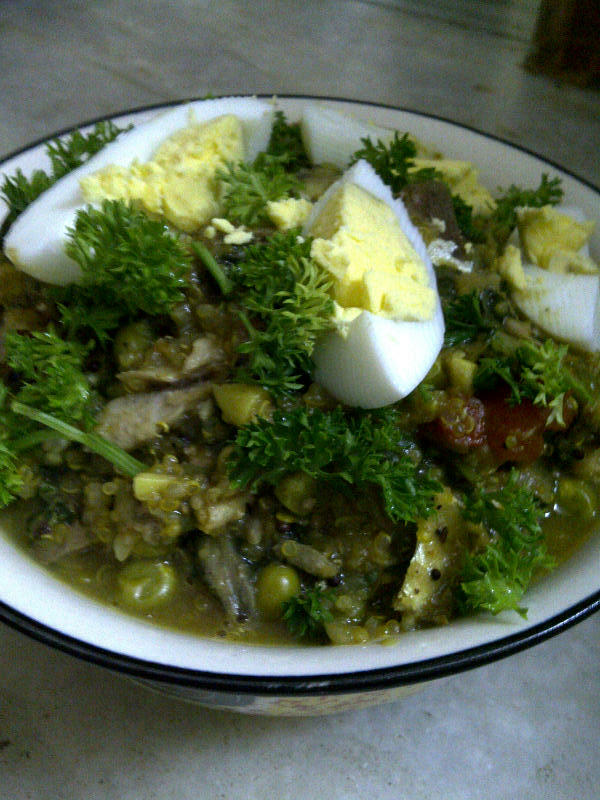 Pohe is a staple across India and in Bangladesh and Nepal. It can be used in sweet and savoury dishes. Till now, I had assumed that pohe was nothing but unprocessed rice which was beaten or flattened. Not so. So pohe are processed after all which explains why they cook so fast. Have just experienced one of those “doh” moments! 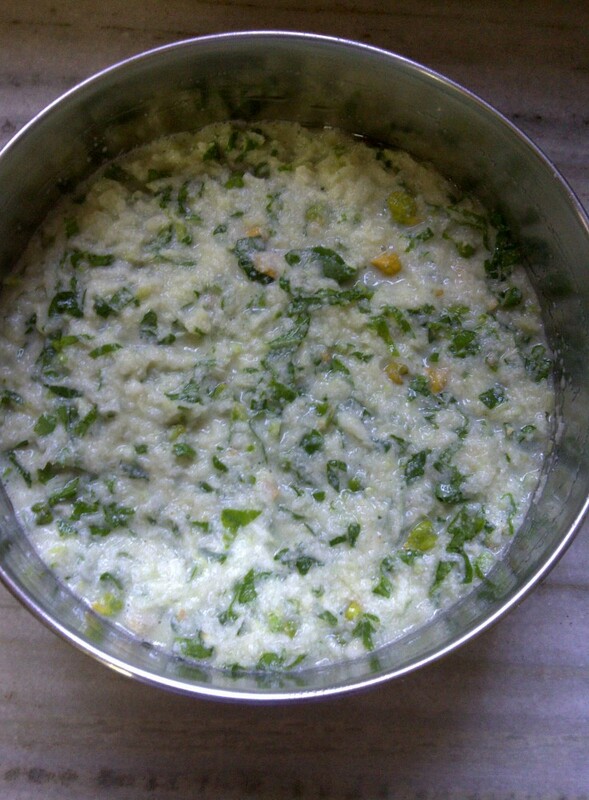 Previously, I have posted an unconventional pohe recipe so today, I would like to share a traditional Maharashtrian one (except for my kooky addition of cauliflower and green pea) and also a simple trick to avoid lumpy pohe. A friend told me that to ensure that your pohe doesn’t clump while cooking, put them dry in a colander, give the colander a good shake to rid the pohe of any floury bits, rinse them in the same colander and let them drain. I have been cooking my pohe this way ever since and each flake stays separate. Today’s recipe was made using red rice pohe but you can use white or brown pohe or even try it with leftover boiled rice. The list of ingredients may seem long but this is one of those quick cook meals. Put the pohe in a colander. Give the colander a good shake and rinse the pohe under running water. Set aside and make sure there is enough space between the bottom of the colander and the kitchen platform for any excess water to drain away. 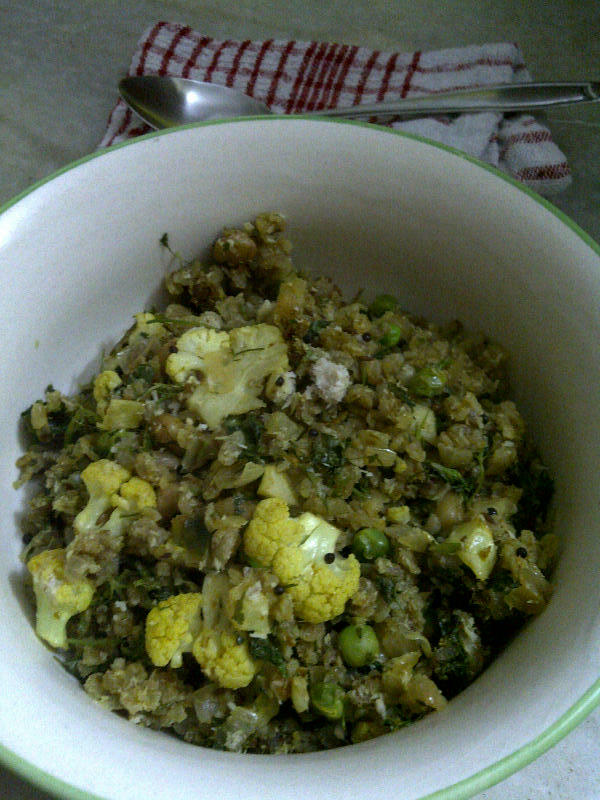 Wash green pea and cauliflower. Chop and wash the fresh coriander. Lower the heat and add mustard seeds and once they start crackling, add cumin seeds. Next, add the asafoetida, peanuts and curry leaves. Stir for about a minute or so. Add the chopped onions, chilli and grated ginger. Sprinkle turmeric powder and salt to taste. Cover and cook on low flame for 5 to 7 minutes till the onion turns translucent. Add green pea, cauliflower and lemon juice. Once again, mix well, cover and cook for about 5 to 7 minutes. At the end of this cooking stage, you want the cauliflower a little undercooked. It should have some bite to it because it will be cooking a bit more once the pohe have been added. Next, add the pohe, coriander and coconut to the vegetable mixture. Mix well, cover and cook for about 8 to 10 minutes. You can adjust the quantity of green chilli and lemon juice according to personal preference. If you can’t get hold of fresh coconut, use dessicated coconut. I am always fascinated by the fresh equivalent of dry foods we use on a day to day basis. 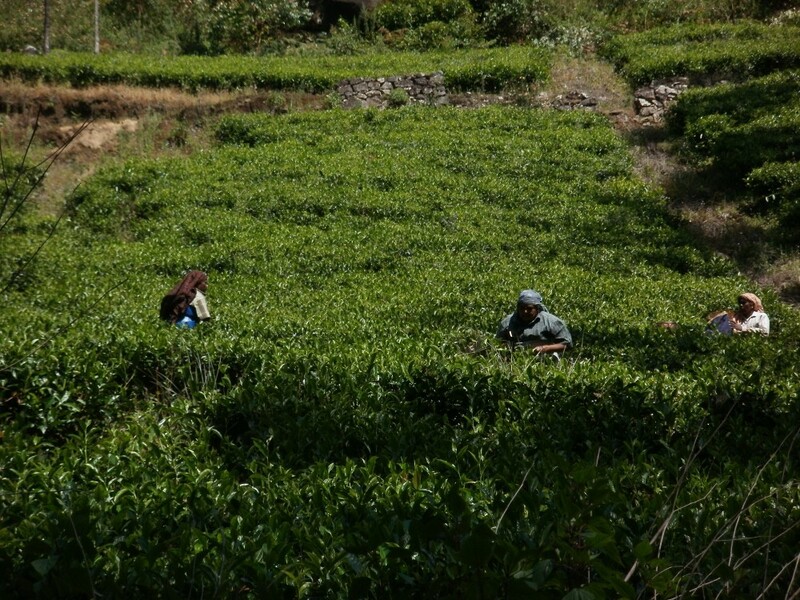 For instance, I saw tea plantations for the first time during my visit to Munnar in Kerala a couple of years back and kept wondering about the stark contrast between the fresh green leaves and their dry powdered equivalent. One of the plantations, the Kanan Devan Hills Plantations Company, has a Tea Museum which demonstrates this very interesting process. Kerala is well known for its spices and I was fortunate enough to also see peppercorns, cardamom and nutmeg in their “fresh” form. In terms of legumes in their green avatar (technically referred to as immature), I have had sorghum (ponk), peanut, chickpea and kidney bean. I was introduced to immature kidney bean last year. 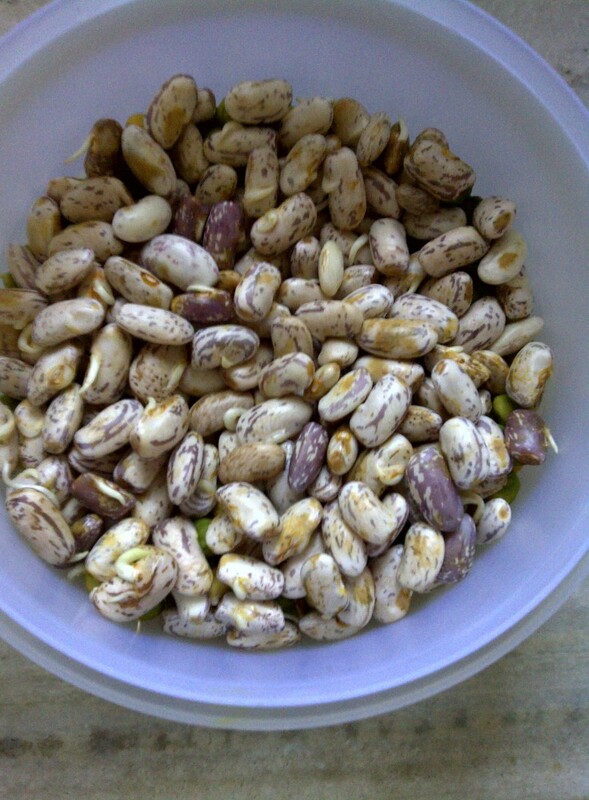 Its outer pod is very light green in colour and the bean itself is pale white with specks of red (as seen in the photo on the left). The bean is large in size and some even sprout in the pod. Star attractions of today’s recipe are fresh kidney beans, fresh chickpeas, fresh green peas, two varieties of aubergine (green and purple) and ridge gourd (also known as luffa, Chinese okra and Vietnamese gourd). Not sure why but fresh legumes don’t feel heavy and are easy to digest. The recipe itself is straightforward and requires very few spices. If you would like to try this curry and can’t get hold of the immature legumes mentioned here, you can substitute with any other types of legume like fresh broad bean, edamame or lima bean. Ridge gourd is easily available in Asian grocery stores. This curry goes well with, both, rice and bread (roti, naan, paratha, bread rolls or even hunk of fresh bread). Wash and mince the chillies. When it becomes hot, lower the flame to minimum setting and throw in the carom seeds. 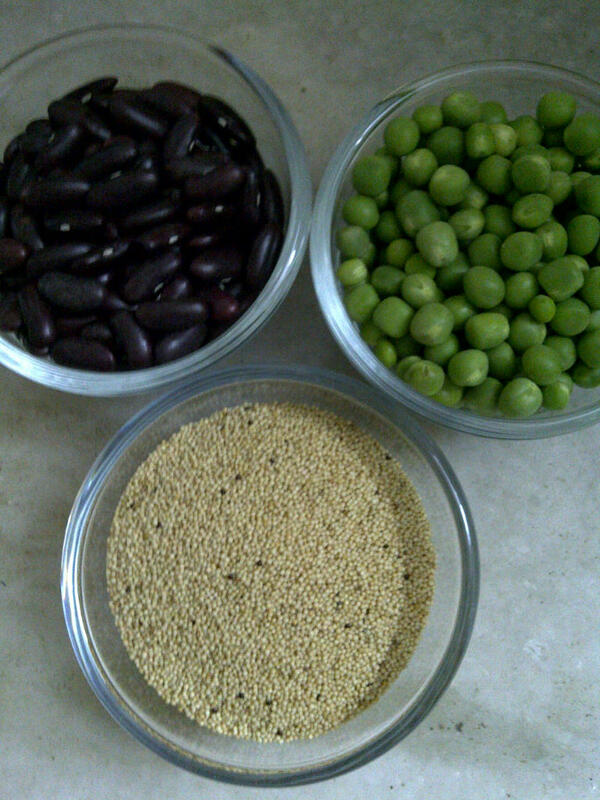 Add the asafoetida, stir for a few seconds and tip in the washed legumes. Add salt, cumin powder, coriander powder, turmeric powder, minced chillies and minced ginger along with about 2 cups of water. Mix well, cover and let the legumes cook for about 10 minutes. While they are cooking, wash and dice the aubergine. Scrape, wash and chop the ridge gourd. After 10 minutes, add the chopped aubergine and ridge gourd. Stir, cover and cook for about 15 minutes till the vegetables are tender and legumes fully cooked. If you are a garlic fan, you can add a couple of cloves of freshly grated garlic just before serving. 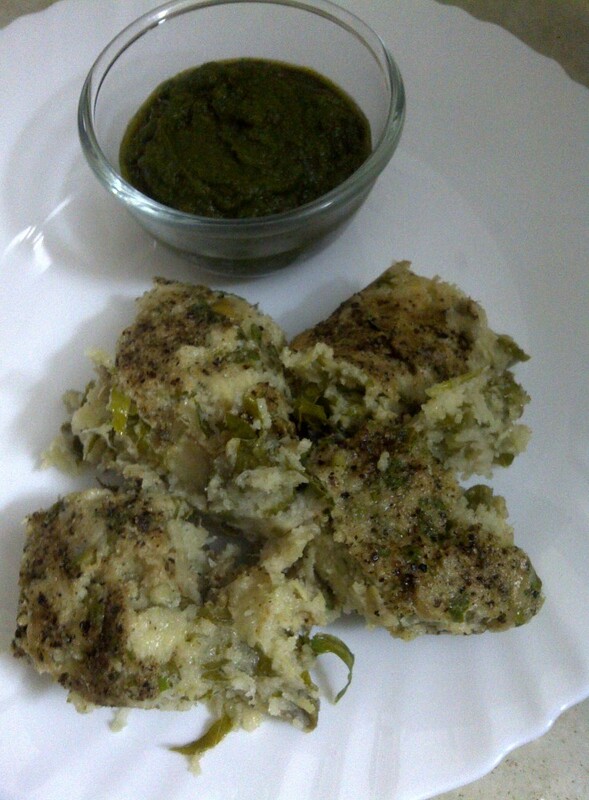 I have talked about the well known Gujarati dish idada in one of my previous posts when I had made them with cabbage. Idada are very healthy because they are made from fermented batter and steamed. Fermented foods have many health benefits and are often overlooked in most people’s diets. 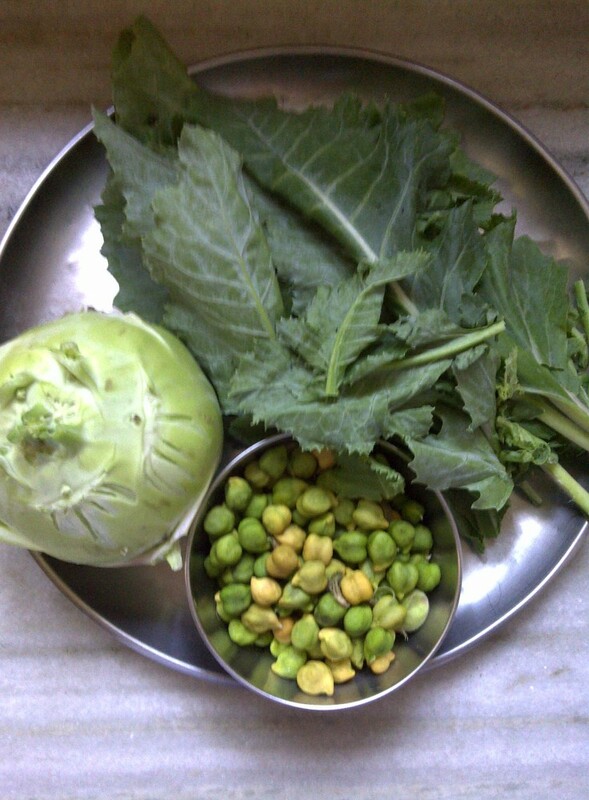 My previous idada experiment was so successful that I decided to replicate it with kohlrabi and fresh green chickpeas, both of which are currently in season. When I had last cooked with kohlrabi (green pea and kohlrabi cake), I had decided to buy the vegetable whenever I saw it. As for the fresh green chickpeas, they are very nice to look at and cook with but a pain to shell. So imagine my delight when I chanced upon a greengrocer selling both (the fact that he was selling shelled chickpeas was a bonus!). As you can see from the above photo, the kohlrabi leaves were very fresh and so I decided to include them as well. At first, I thought I would coarsely grind the chickpeas in a food processor before adding them to the batter but then I decided to throw them in whole. If you would like to make these, you can either use ready idli batter (in the UK, ready batter is available in many Indian grocers) or you can soak the rice and lentils, grind them and ferment them. As it is still a bit cold where we are, I used my ‘fermenting in cold climate‘ method to get the batter to rise. It took nearly 48 hours for this process to happen. If you can’t get hold of fresh green chickpeas, you can use green peas instead. 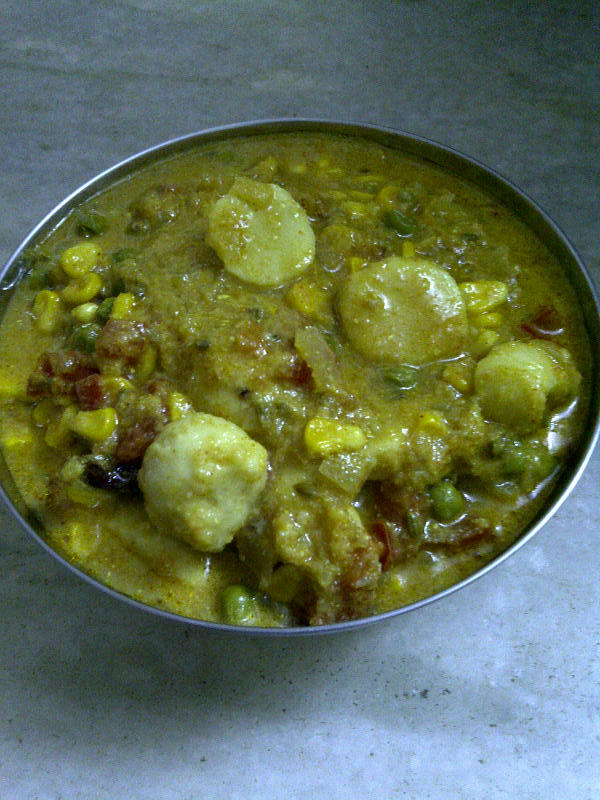 The following method is using ready idli batter. If you would like to soak, grind and ferment, please go here for instructions and quantity. First prep the kohlrabi. Discard any tough stems and keep the fresh leaves. Peel the kohlrabi with a regular knife, The skin will come off very easily. Wash and finely grate the kohlrabi. Wash and finely chop its leaves. Wash the fresh chickpeas or green peas. Wash and mince the chilli. To the idli batter, add the grated kohlrabi, chopped leaves, chickpeas/green peas, chilli, ginger and salt to taste. Grease a cake like tin with half tablespoon oil and pour the batter in it. Evenly sprinkle coarsely ground peppercorns across the surface of the batter. Once cooked, remove from the steamer and drizzle the remaining oil (and a bit more if you like). Let the idada sit for about 3 to 4 minutes before cutting in square or diamond shape and serving. To check for doneness, insert a knife or a toothpick, it if comes out clean you know that they are cooked. This is how my batter looked waiting to be steamed. Statistics tell me that Panchkutiyu Shaak is one of the most viewed posts on Kooky Cookyng. While this is good to know, am not sure what the reason could be. So here I am sharing with you another version of this famous Gujarati vegetable dish which is a bit different from the previous one I have posted. 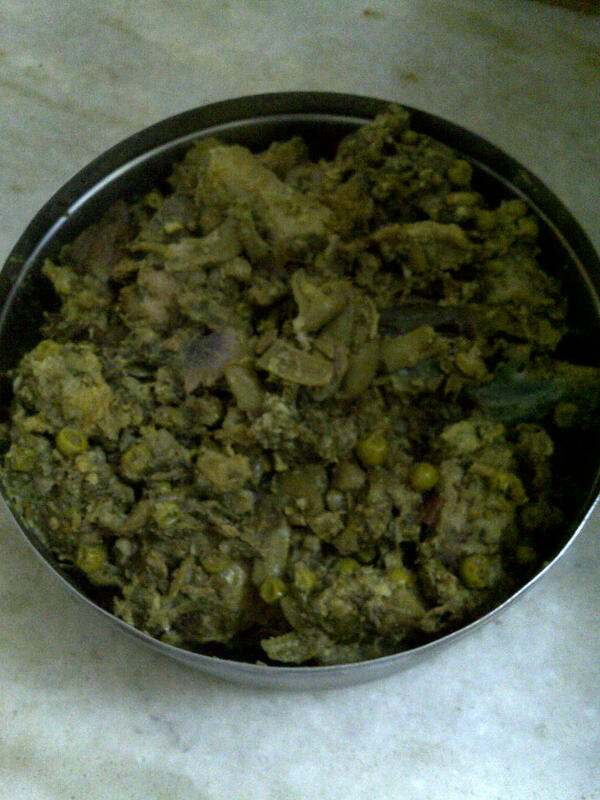 For starters, panchkutiyu means five [vegetables] whereas this particular recipe uses seven different vegetables. Also unlike the other recipe, in this one green garlic is optional and I have added muthiya (although you can do away with them if you like). This particular recipe can be cooked any time of the year using seasonal flat beans (papdi). The following should be good enough for 4 people. Goes very well with rotis. Any leftover tastes even better. First prepare the masala mixture. Chop and wash the coriander. Clean, chop and wash the green garlic (if using). Take a large mixing bowl in which you need to add the grated coconut, coriander leaves, garlic, cumin powder, coriander powder, turmeric powder, minced chillies, minced ginger and salt to taste. Mix this with a spoon or hands, whichever is easier. Set aside. Next, work on the vegetables. Top and tail the flat beans and split them open. If very long, you can snap them in two else leave them whole. Peel, cut and wash purple yam. Cut and wash sweet potato. Peel, wash and cut bottle gourd. Wash and cut the aubergine. Mix the bicarbonate of soda and half of the coriander-coconut mix to the flat beans and set aside. 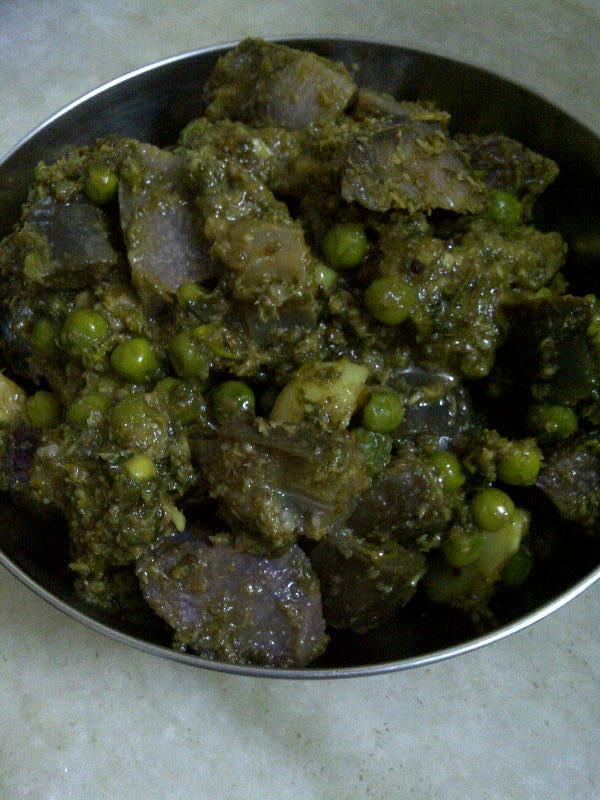 Combine the remaining vegetables (purple yam, potato, sweet potato, green peas, bottle gourd and aubergine) and add the remaining coriander-coconut mix. Toss the vegetables around so that they are evenly coated with the masala. Take a large cooking pot which has a tight fitting lid. Place it on high heat and pour oil. Once the oil is hot, add the carom seeds. As soon as they start spluttering, add the asafoetida. Add the papdi and stir well. Next, add the remaining six vegetables and mix them with the papdi. Place the sliced muthiya on top of the vegetables. Pour two cups of water and cover the mouth of the pot with a foil so that steam doesn’t escape easily. Now cover with the tight fitting lid, lower heat and let the vegetables cook on very low heat for 2 hours. Do not open in between. The vegetables shouldn’t stick to the bottom as we have sealed the mouth of the pot plus added 2 cups of water plus the vegetables like bottle gourd and aubergine will release their own moisture. Once the vegetables start cooking, you will get the aroma. After 2 hours, take the cooking pot off the heat and let it sit for 15 minutes. Remove the lid and open the foil. 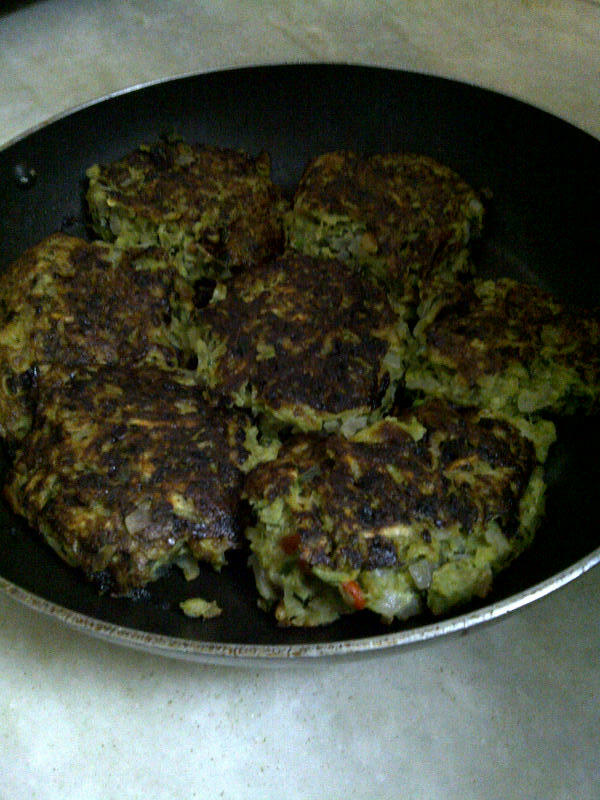 Mix the muthiya with the vegetables and check for doneness. Cut the vegetables into large chunks so that they do not break or dissolve while cooking. If the vegetables are not fully cooked after two hours, put the foil and the lid back and cook for additional 15 to 20 minutes. If you feel the need to add more water at this stage, make sure that you add boiling water (not room temperature). Yes, yes, I am prepping you for the forthcoming Oscars and speeches galore :-). So now I stop my speech and I get off my faux Oscar stage to tell you about one of THE most easiest, THE most delicious and THE most memorable spaghetti dinners I have ever cooked (seriously, thanks to Teagan and my sister). 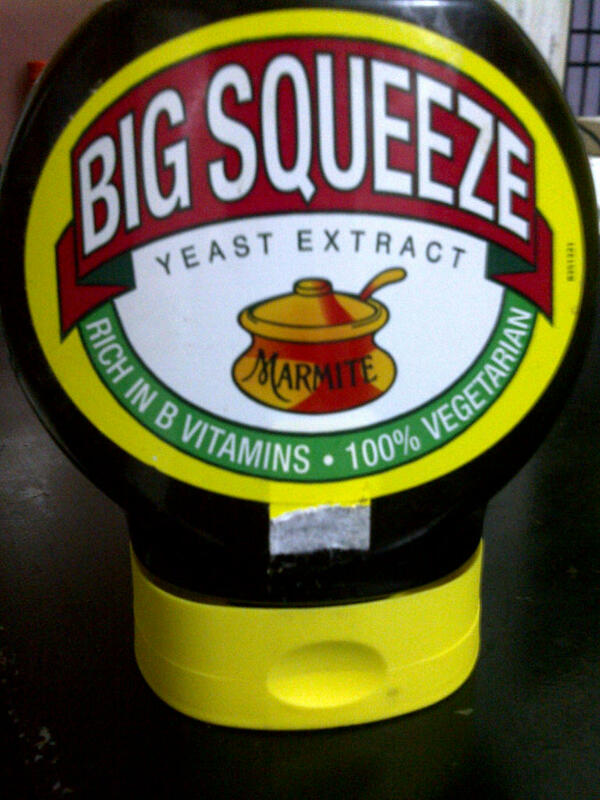 I know that marmite is one of those foods which those who have eaten either love of hate. I belong to the love camp as you can see by the industrial size marmite jar I have in my kitchen! As you can see by the photo, I have improvised Nigella’s recipe which is simply spaghetti, butter and marmite. Yesterday, I had a pretty long and hectic day with no time for lunch and, therefore, I wanted to add some vegetables to the spaghetti to make the dinner more balanced and nutritious. 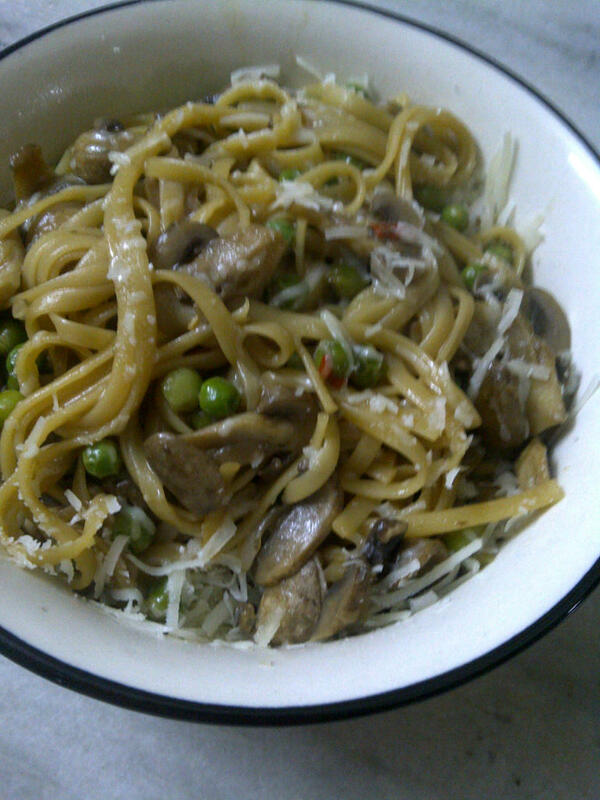 I decided to pair the original recipe with mushrooms and green peas as I felt that they would work well with marmite. Also, I was out of spaghetti so used linguine (same thing to my mind although some purists may disagree). And the experiment totally worked. So here’s my kooky version of Nigella’s Spaghetti with Marmite. Boil the spaghetti/linguine according to instructions on the packet. Drain and set aside. Also set aside about half cup of water from the drained spaghetti, you will need it later. Wash/wipe and slice the mushroom. Peel, wash and slice the onion. Wash and finely slice the red chilli. Dilute marmite in the half cup reserved water. Add the olive oil, sliced onion, chill and a pinch of salt in a wide based pan. Put the pan on low heat, cover and let the onions cook for 5 to 7 minutes. Uncover, throw in the peas, cover and cook for 5 minutes. Uncover, add the mushroom and marmite mixed with water. Stir, cover and cook for about 5 minutes. Uncover, add the boiled spaghetti/linguine and 1 tablespoon of Parmesan cheese. Mix well, check for salt, add more if needed, cover and cook for 3 to 4 minutes. Transfer to a pasta bowl and eat hot with a generous sprinkling of Parmesan.